alaTest has collected and analyzed 20 reviews of Sony Handycam HDR-XR350V. The average rating for this product is 4.4/5, compared to an average rating of 4.1/5 for other Camcorders for all reviews. Reviews about the zoom and battery are generally positive. The reliability and image quality also get good feedback. There are some mixed comments about the portability, and there are some negative views about the viewfinder. We analyzed user and expert ratings, product age and more factors. 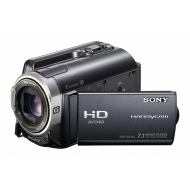 Compared to other Camcorders the Sony Handycam HDR-XR350V is awarded an overall alaScore™ of 81/100 = Very good quality. Incredible product. Would recommend to anyone thinking about getting a stabilized camcorder for personal or small business use! You Get A Lot, But Well Worth The Price. Preserve your memories in spectacular 1920 x 1080 high-definition with the HDR-XR350V Handycam camcorder. Great for travelers, this 160GB hard disk drive camcorder features a GPS receiver that can display your current location and remember where you shot your video. Enjoy superior low-light performance thanks to the back-illuminated "Exmor R" CMOS sensor. In addition to 7-megapixel still image capture for high-resolution digital photos, this HD camcorder also has Optical SteadyShot image stabilization for superior image smoothness. Plus, capturing smiling faces has never been easier with Face Detection and Smile Shutter technologies.